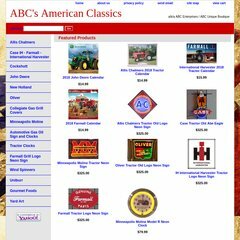 Topics: Abc's American Classics, Allis Chalmers, Cockshutt, and John Deere. abcuniqueboutique.com Heads Up! Caps-Bandanas-Stocking Caps-Scarves! Inktomi Corporation (California, Sunnyvale) is the location of the YTS/1 server. Its IP Number is 68.142.205.137. There are 4 DNS records, such as ns9.san.yahoo.com, yns1.yahoo.com, and yns2.yahoo.com. PING html.store.yahoodns.net (68.142.205.137) 56(84) bytes of data. Pinging the server, resulted in a 36.1 ms response.